Decline was posted on April 4, 2013. In total, this clip is 0:46 long. [0:00] The beginning of a film reel plays for a few seconds. [0:03] Brief shot of some hills overlooking a lake. [0:04] White text over a shot from the inside of a moving car: “Everything is normal.” The text only shows on the dark parts of the shot. [0:18] White text over a shot of an open field with houses in the distance: “I worry about nothing.” A shot of Alex tied to the chair from Entry #67 overlays the shot at 0:25. [0:27] A few frames of a white figure standing in the Rosswood Park tunnel. [0:28] Clip of the Hooded Man attacking Alex in the hospital from Entry #67. A face appears in the lower right corner at 0:29, just before the clip changes to Tim punches Alex from the same entry. [0:30] Clip of the Hooded Man pointing the gun at Alex from Entry #67, then a few frames of the Hooded Man in the maintenance tunnel from Entry #68. 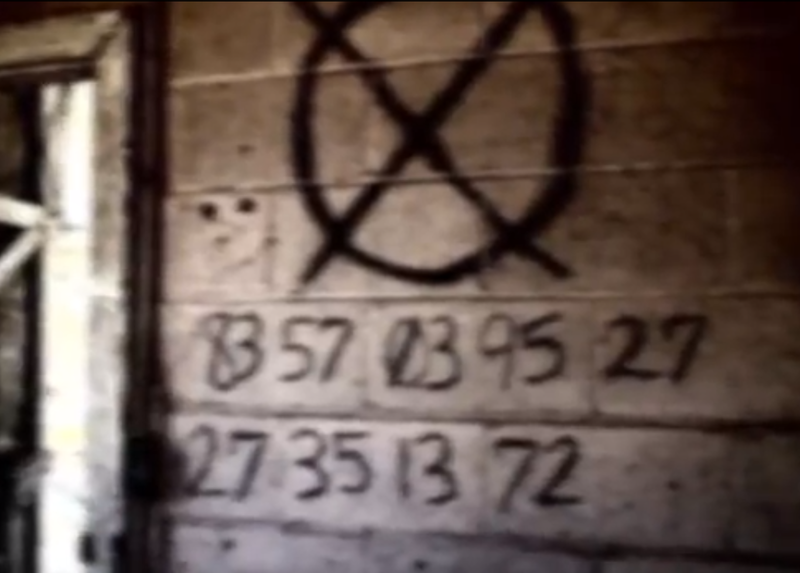 [0:38] An Operator symbol on a wall, the numbers “83 57 03 95 27 27 35 13 72” are painted below it, followed by a quick shot of Alex with blood on his face from Entry #14. [0:41] Electronic sounds over a shot from a car driving down a dark road. The white figure from Decay appears briefly on the right side of the screen. A code appears on a wall at around 0:38: "83 57 03 95 27" followed underneath by "27 35 13 72". This has been decoded to "He will pay" using the Twitter cipher. 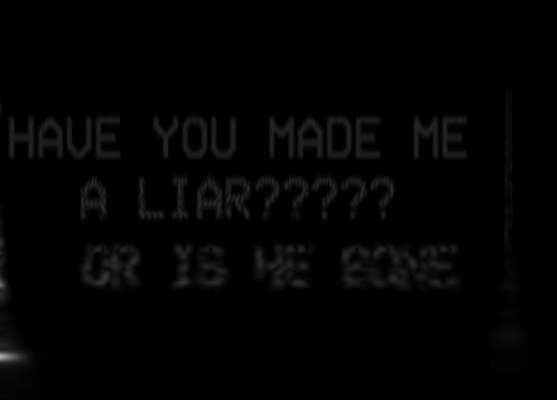 The message "HAVE YOU MADE ME A LIAR????? OR IS HE GONE" is encoded into the audio at the end of the video and can be seen in a spectrogram. The music playing in the background is similar or the same to music in other TTA videos - if TTA is a group, this is going back to the old person. TheTimpanist. The video was uploaded on April 4th - Alex's birthday. If we believe what was previously said in a TTA video, then last year was Alex's last birthday. This could tie together very well into "Hoody (TTA) killed Alex in Entry 68". TheTimpanist. Summation of above two theories: The old TTA, still unknown, but most likely a cast member of Marble Hornets threatened Alex it would be his last birthday last year. Sometime between then and now, Hoody joined TTA's side, whatever it is - although it clearly seems beneficial towards Jay. TTA was relying on Hoody to take care of Alex and upload proof onto Jay's channel - giving an explaination for Entry 68 - but it doesn't clarify if Alex is dead or not. This video is not directed at Jay, but directed at Hoody as seen here. The Timpanist.